Target was the most expensive of the major retailers studied in grocery, with prices 8.4% more than Amazon’s. Meanwhile, Walmart has eclipsed Amazon in e-grocery shopper share, and supermarkets and other food stores have increased their online customers. And not to be left out is Target, which is more than holding its own in providing an omnichannel grocery experience versus Walmart and Kroger. For the online price competitiveness analysis, Boston-based Profitero examined pricing of 100,000 products in 15 categories from April to June at a range of leading retailers. During the period, no retailers beat Amazon on grocery. Target was the most expensive of the major retailers studied in grocery, with prices 8.4% more than Amazon’s, Profitero reported. Kroger, the largest U.S. supermarket operator, had e-grocery pricing 8% higher than Amazon’s during the period. Grocery prices in comparison with Amazon were 17% more via Instacart and 27.8% more on CVS.com. In comparison with the February study, Target’s prices rose 2% in the latest period analyzed. And while Profitero also saw Walmart’s online grocery prices increase since its previous study, Jet’s prices decreased 5% in that time. 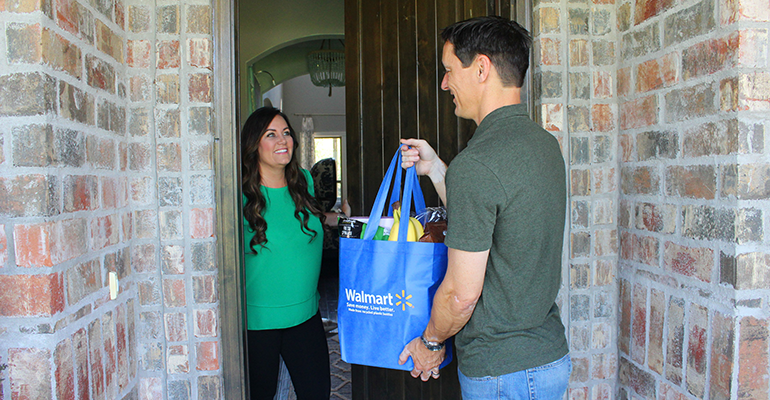 Walmart, however, is starting to win over more e-grocery customers, according to consumer research firm Retail Feedback Group (RFG). RFG’s 2018 U.S. Online Grocery Shopper Study, released this month and based on a survey of 760 consumers, has Walmart with a 33% share of online grocery shoppers, up from 26% in 2017. That moved the retail giant past Amazon, which saw its e-grocery shopper share drop from 36% last year to 31% this year. Supermarkets/food stores also garnered more online customers, with their share rising to 26% from 24% a year ago. 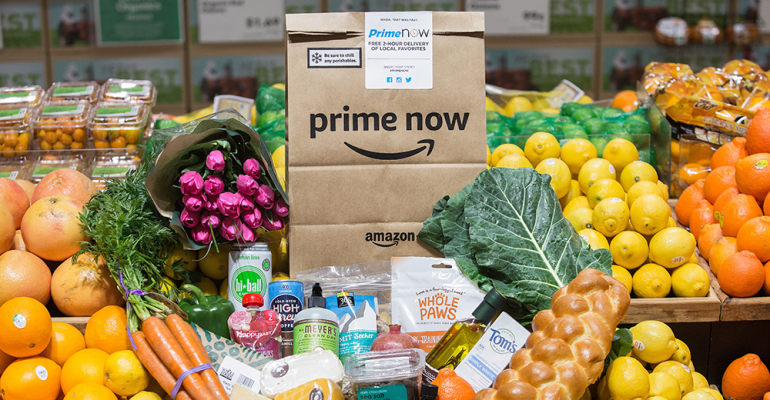 Amazon draws more repeat usage from online grocery shoppers than its competitors. Yet Amazon draws more repeat usage from online grocery shoppers. Sixty-one percent said they shop at Amazon more than five times, and 28% do so two to five times. That compares with 41% more than five times and 42% two to five times at Walmart, and 42% over five times and 34% two to five times at supermarkets/food stores, Profitero’s report said. Seventy-three percent of respondents said they’re highly likely to recommended Amazon’s online grocery offering, just behind Instacart at 74% but ahead of Walmart (67%) and supermarkets/food stores (61%). In the coming year, 52% of Walmart shoppers and 50% of supermarket/food store customers said they plan to buy more groceries online, versus 47% of Amazon shoppers saying they aim to do so. “Clearly, Amazon, Walmart and Instacart are taking advantage of both their experience in the space, and the capital they continually invest, in improving the online grocery ordering and fulfilment experience,” commented Doug Madenberg, principal at Lake Success, N.Y.-based RFG. “Supermarkets and food stores operating e-commerce on their own or through a third-party platform should take note of Instacart's scores and ensure their service provides an experience at the same or higher level." But in terms of delivering a seamless, omnichannel grocery shopping experience, Target bested Walmart and Kroger in an analysis by Brick Meets Click. The Barrington, Ill.-based strategic advisory firm assessed the three grocery leaders’ omnichannel experience in three areas: accessibility, attractiveness and acceptability. Target had the highest composite rating at 3.4 out of 5, ahead of both Kroger at 2.8 and Walmart at 2.3. Walmart has eclipsed Amazon in e-grocery shopper share. In online grocery accessibility, or the ability to use a retailer’s solutions, Target led with a 3.7 score, compared with 2.7 for Kroger and 2.3 for Walmart. Target also was first in acceptability, or the ability to generate better experiences, with a score of 3.8 versus 2.8 for Walmart and 2.7 for Kroger. However, Kroger came out on top in attractiveness — the ability to improve or replace in-store shopping — with a score of 3.0, topping Target at 2.7 and Walmart at 1.4.